New England Fall Events:: The Best Guide to Apple Picking, Pumpkin Patches, Hayrides, Corn Mazes, Hayrides, Food Festivals and Fall Fun. Visit our companion site Halloween New England for complete listings on New England Haunted Houses & Trails, night/haunted Hayrides, night/haunted Corn Mazes, Ghost Tours, Salem Attractions, Costumes, Halloween Events, and more! 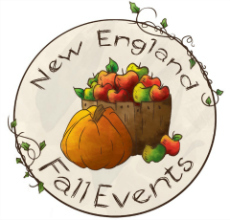 New England Fall Events is your best guide for seasonal fun and fall activities. We have state-by-state guides to the best PYO apple picking, pumpkin patches, hayrides, food festivals, harvest celebrations, and events for the fall season. New England Fall Events makes it easy to create new fall traditions and priceless family memories. This is a guide for New Englanders, by New Englanders. Slow down and savor New England’s fall culture and traditions by celebrating the orchards, farms, small businesses, seasonal attractions, fall festivals, and local food which are the very fabric of our communities. * Our site is constantly being updated and we always love hearing from you! If you would like to submit your attraction, please click here. Remember, even best laid plans are subject to New England weather or unexpected circumstances. When it comes to fall activities and events, weather and picking conditions vary so it's always recommended to call ahead to ensure that your activity or event is on as planned.